Yesterday marked my two year anniversary of switching to Mac. How did I celebrate? I bought an iPad 2! Yes, the iPad, the gadget that first came out a little over a year ago that I made fun of. At the time, I didn’t see the need for one since I have an iPhone and a Macbook Pro. It wasn’t until about several months ago that I started to realize how handy it would be. Allow me to share my reasons for becoming an iPad owner. 1. Using it in the kitchen. This was my big, main reason I wanted to get one, as domestically nerdy as that sounds, hah. First of all, Weight Watchers has an app for the iPad called their kitchen companion which gives you access to the entire database of recipes. How convenient it would be to have all the recipes you could ever want on one gadget, especially since there’s all these recipe sites on the web, eBooks and you can import PDFs onto it; I can scan my favorites recipes from my cookbooks, so I don’t have to frantically flip through those. I’ve tried to use my iPhone in the kitchen, but its size does make it difficult to use. With the iPad I can prop it up a lot easier than a cookbook. 2. Using it for work. Being a freelance web designer I’ve found myself in countless situations where it would have been handy to whip out an iPad and show some of my work to a client. I don’t always lug my laptop with me, but having quick access to the web is nice, especially on a larger screen. It’s hard to get an idea of a good-looking web site on an iPhone if you’re a client and have to squint to see it. 3. Books, magazines, and entertainment. While the iPad will never replace my love for books, it has made reading some of them a lot easier. For example, I was an avid reader of the Oz books as a kid and can now enjoy reading the whole series for free thanks to iBooks. Phantom of the Opera, Pride and Prejudice, all of Hans Christen Andersen’s Fairy tales, and much more all free. Only $19 for the whole Lord of the Rings trilogy. All on one gadget. Glamour magazine? Free app and $0.99/issue versus $3.99 for the hard copy. Also I know my school is slowly going from textbooks to eBooks for some classes. Netflix, YouTube, my movie collection, all on a nice big screen. All of these are nice things to have on one nice big gadget, especially since we tend to do a lot of road trips. Plus, I can take some of the entertainment load off my iPhone. 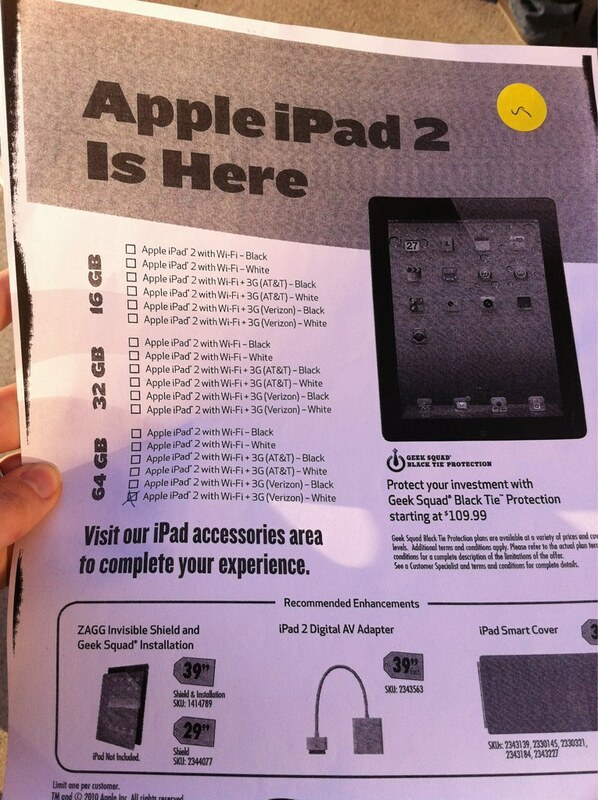 The iPad 2 was released yesterday, and I was one of the lucky ones to get one that day. Joshua and I originally headed to the Apple Store up in Roseville, getting there at 5 o’clock on the dot. We knew the availability of parking spots and a line not going out of the mall meant it was too good to be true. Sure enough we get in line, and an Apple rep tells us they handed tickets out for as many iPads as they had in stock and already handed them all out. We could wait around if someone decided in the end they didn’t want theirs, but our chances of getting one were pretty slim. Luckily the Apple Store wasn’t the only game in town. We headed across the street to Best Buy where they too were handing out tickets. I managed to snag one of the last three just in time! 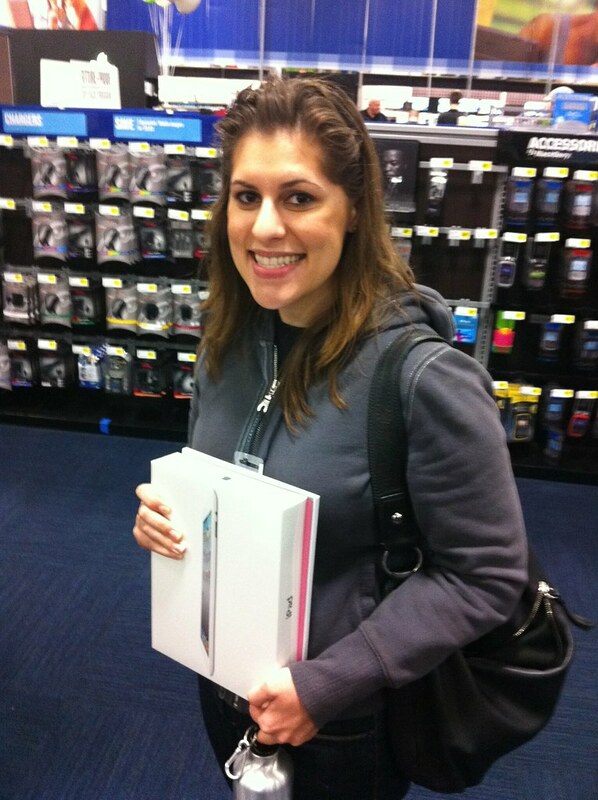 About 90 minutes later I got my white Verizon iPad (her name is EVE) along with a pink Smart Cover, and then we were out the door! So far I am very happy with it. It’s taking a little getting used to because there are some features that are different from the iPhone. Still, I’m looking forward to seeing what this thing can do! Great review! Since this is your first iPad, you probably won’t be as able to explain the differences between the original and this one, but that’s what I’m wondering about now. Because I think I may have to get one now! Haha!